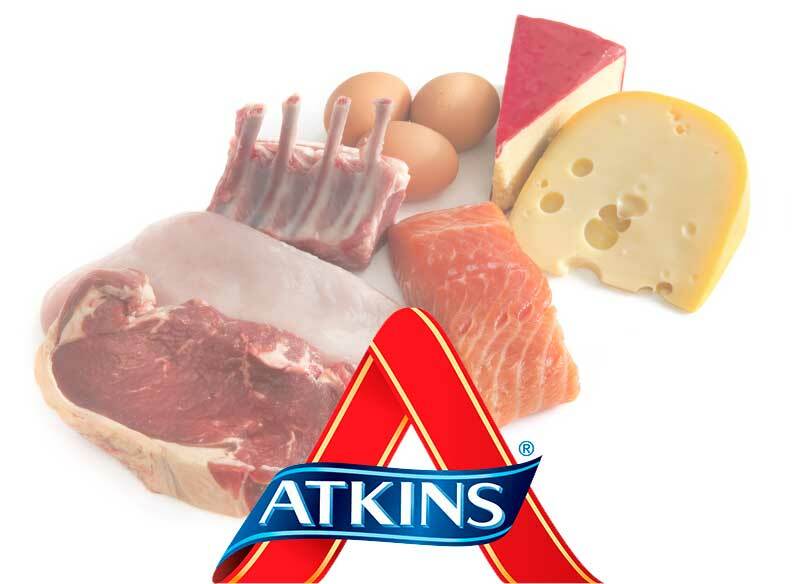 Atkins diet foods are easy to find and available everywhere. There are many varieties to choose from, whether you pick prepackaged low-carb diet foods or make your own meals. No matter how you want to do the Atkins plan, there is a solution out there for you. You’ll need to keep the Atkins food pyramid in mind when you make food choices. The Atkins pyramid looks much different than the USDA Food Guide Pyramid. The base of the pyramid consists of protein sources such as eggs, fish, beef, chicken and tofu. On a daily basis, your diet should consist primarily of these foods. The second tier has low glycemic vegetables like salad greens, broccoli, cauliflower, asparagus and spinach. The third tier is made up of berries and avocado. Fruits should be used on an occasional basis after the initial stages of the Atkins diet. Vegetable and seed oils, cheese, dairy, nuts and legumes are used sparingly and in appropriate portions. While the FDA pyramid has oils and fats at the top peak, the Atkins pyramid places whole grain foods in this spot. Whole grain foods should be used very occasionally and don’t make up the mainstay of the Atkins diet. When you start the Atkins plan, you’ll need to make sure you understand which foods are acceptable for your stage of the program. The Induction phase is the most restrictive, but it only lasts two weeks. You owe it to your dieting success to stay within the acceptable foods list. One of the best ways to do this is to follow the Atkins menu plans that are printed within the New Diet Revolution book. There are also Atkins cookbooks and cookbooks that are geared toward other low carb diets that are helpful in formulating meal plans. It’s a helpful idea to use a cheat sheet of acceptable Atkins foods wherever you go. If you are out and about and hungry, the last thing you want to do is to try to think back in your memory to figure out what you can and cannot eat. Carrying a list of acceptable foods with you will make finding a snack or meal while out on the run easy. You can’t always rely on “low carb” labels to tell you whether or not something is diet friendly. Ever since low carb became the new diet craze, manufacturers have been jumping on the bandwagon to attract Atkins dieters. They label items low carb to sell products and don’t have your health in mind. Relying on foods from your own personal list is the best way to stay on the plan. Another good resource for keeping track of the appropriate Atkins foods is an online diet program. There are several available. Some are free and some have a small monthly fee. The programs require you to register and then they provide you with personal weekly menu plans based on your needs and your carbohydrate gram level. There are normally printable weekly shopping lists that make picking up your Atkins diet foods from the grocery store easy and quick. Atkins diet food is easy to find once you know what you are looking for. The books, food pyramid and online resources can help you make better food choices and stay on the diet for the long term. The Induction phase of the Atkins diet is one of the most important stepping-stones to successful weight loss. In addition to the list of acceptable foods, there are a few rules that are important to follow during this period of the diet. During Induction, you need to eat three regular-sized meals per day or four to five smaller meals. If you find yourself jittery and hungry between meals, try breaking down your meals into smaller portions and eat more frequently. In order to stave off carbohydrate cravings, you’ll need to constantly keep your body running on the proteins and vegetables on the plan. Never skip meals and never go more than six waking hours without eating. You can eat freely from the list of acceptable foods. Do not restrict your fats and proteins. Eat as much of them as you like. Remember, the Atkins diet is not a calorie-restricted diet. The only thing you need to worry about is your level of carbohydrate grams. Make sure to count your carbohydrate grams when you eat vegetables, cheese and beverages with Splenda. At least 12-15 grams of your allowed carbohydrates should be from your vegetable list. While it may be tempting to eat them all in cheese, vegetables are important to your digestive system (especially while on this diet). Avoid all fruit, bread, pasta, grains and starchy vegetables (like cauliflower or squash) during this initial period. These foods will be slowly introduced throughout the course of the pre-maintenance phase. Although beans are high in protein, they also include carbohydrates and should be avoided during this phase. If you feel that you must have some grain products, you should limit yourself to high fiber low-carbohydrate products. However, this may slow down your weight loss process. Anything that isn’t on the acceptable food list is forbidden during the Induction phase. Don’t be tempted to just have “one bite.” Your one bite may turn into two, and then before you know it you’ll end up ruining your diet. Remember to adjust the quantity of acceptable foods to suit your appetite. At the beginning of the Induction phase, you may find yourself eating much, much more than you will toward the end of the phase. As your body breaks its addiction to sugar and carbohydrates, you will be less hungry throughout the day. When this starts to happen, make sure to eat only what you need. Eat until you are satisfied and not overly stuffed. Always read the labels of packaged products, even if they claim they are “carb free.” You may find that some products have hidden carbohydrates. The law allows manufacturers to round off to zero if a product has fewer than .5 grams of carbohydrates. Look at the list of ingredients for manufactured products to determine if there are hidden carbs. You’ll also need to watch out for hidden carbohydrates when you eat out. There are small carbohydrate amounts in gravies, sauces and salad dressings. The best bet is to eat your meat without sauce and eat your salad with olive oil and vinegar dressing. Remember to drink 8 eight-ounce glasses of water, in addition to anything else you might drink. This will keep your body hydrated and help you avoid constipation. You’ll also be able to flush out the by-products created by fat burning. Keep all of these guidelines in mind when you start the induction phase and you’ll be setting yourself up for long-term success with the Atkins diet.